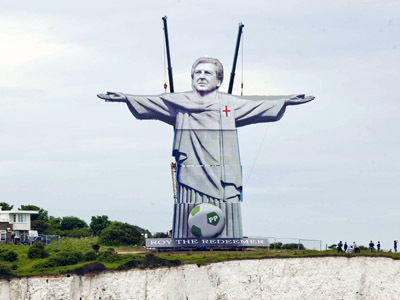 A 100 foot statue with the face of England football manager Roy Hodgson has been unveiled on the white cliffs of Dover. ­The stunning structure is a reproduction of the iconic Christ the Redeemer statue which overlooks Rio de Janeiro, but with the face of Christ replaced by England's new ‘saviour’, Hodgson. The structure which took a team of engineers two months to create and one week to install is to inspire England supporters ahead of Euro 2012. Bookmaker Paddy Power hope it will encourage England fans who think their team needs divine intervention for success in this month’s European Football Championship. "Since Christ the Redeemer was constructed in Rio de Janeiro in 1931, Brazil has gone on to become the world's leading footballing nations," spokesman Ken Robertson said. Paddy Power claim the statue is a 'potent symbol of hope' for England fans at a time when expectations for a tournament triumph are at an all-time low. The majority of England supporters believe the team do not have a prayer at Euro 2012 with just four per cent expecting a win. With the England team suffering a number of setbacks, including the loss of key players like Frank Lampard, Gareth Barry and Gary Cahill to injuries, most England supporters think the team will need all the help it can get. The eight ton sculpture is said to be visible from France so fans hope it will strike the fear of God into England's first opponents, 'Les Bleus', ahead of Monday's opening group game.